DRM on a specific brand of cat litter box has been cracked. In other news, DRM on cat litter boxes exists. [Jorge] moved into a new apartment with a feline companion and wanted one of those fancy, auto-cleaning litter boxes. Apparently only one such device exists, the CatGenie. 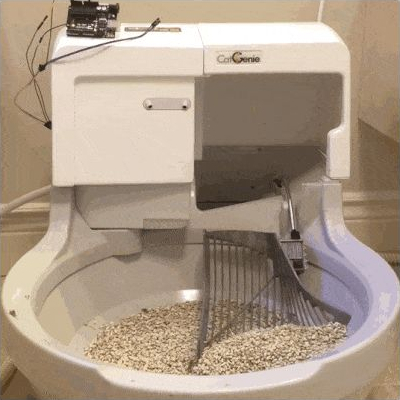 This ‘Rolls Royce of cat litter boxes’ uses little pieces of plastic granules as ‘functional medium’ that are scooped up, cleaned, and returned to use. These granules are washed with a cartridge full of fresh-smelling cleaning solution that comes in a container with an RFID tag. Yep, DRM’ed cat boxes. Welcome to the future. After cruising around the Internet, [Jorge] found a CatGenie community that has released open source firmware for a litter box and something called a CartridgeGenius, a drop-in replacement for the cartridge tag reader in the litter box. It simulates both the RFID tag and its reader, allowing any robotic litter box owner to select between 120 cycle cartridges, 60 cycle cartridges, a maintenance cartridge, and set the fill level of those cartridges. Previously, [Jorge] was spending about $350 a year on the solution to clean these plastic granules, so in a few months this CartridgeGenius has already paid for itself.